One of the key angles in the mainstream press coverage of the Day3X protest last week, particularly from the BBC, is that the heavy-handed police response was justified because the march "deviated from the agreed route". The Metropolitan Police Service is extremely disappointed with the actions of many protestors who from a very early stage deviated from the agreed route. There were people on this protest who came with no intention other than one of violence and to commit disorder. This sentiment, which worryingly and wrongly conflates protestors taking a different route and intending to commit violence, has been echoed by many BBC commentators. On the edition of Newsnight which followed the protest, considerable weight was given to the issue of the protest diverging from an agreed route. The implication being that once the protestors had demonstrated this wilful disobedience and lack of co-operation, they brought everything that followed onto themselves; if only they had kept their agreement with police, none of the containment or brutality which followed would have been necessary. Quite aside from this point of view being somewhat patronising, there are a number of problems with this line of reasoning. Chiefly, the idea that the police's duty to facilitate peaceful protest is solely dependent on protestors' obedience. A negotiation prior to a protest can be useful for both protestors and police, but it is not a legally binding contract, and if events play out differently on the day this does not give the police carte blanche to punish all and sundry with detention and physical violence. Furthermore, the live coverage via Twitter and blogs from the day give a clear impression that most participants on the march were not aware of what the "agreed route" was. Who was it agreed with? Was the information made public prior to the day? Is everyone who participates in an action bound by the agreement of a few, if there are no designated leaders or police liaison team? How should the police engage with an activist movement which is as fluid, decentralised and open as UKUncut and its sympathisers? In this image, the "agreed" route is shown in red, with the blue lines representing "do not cross" police lines. Parliament Square is the white square between them. The red route was apparently negotiated between police and representatives of the National Campaign Against Fees and Cuts before last Thursday's protest. 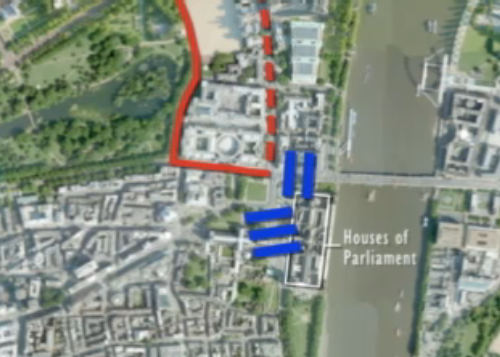 It seems to approach Westminster via Horse Guards Road, travel along one side of Parliament Square via Great George Street/Bridge Street, and then turn back on itself via Parliament Street and Whitehall to an "agreed rally point" at Victoria Embankment. A few points here. Firstly, there were multiple marches leaving from different places, and for the police to attempt to impose a single route on a decentralised, plural protest seems naive in the extreme. The National Campaign Against Fees and Cuts are not elected spokespeople for everyone who marched that day, and they were not empowered to speak on behalf of all who participated. Secondly, reports are varied as to which route the march did follow to Parliament Square - partly a consequence of different groups arriving at different times and taking different routes, but also of small groups splitting off from the main column of the march and finding their own way to parliament. Thirdly, it seems highly unlikely that any march past Parliament which concerns a vote in session at the time would approach the Commons and then walk away again. The Met's negotiating team in particular should have had enough experience of public order situations to know how hard this would be to enforce; they should have rejected a route that went through the square unless they were happy for it to stop there. Fourthly, while journalists have commented that the march reaching Parliament Square at all was a "major failure" of policing (Independent), and some activists have said that "We were not supposed to have got into Parliament Square at all, but the numbers floored the police plans," this map suggests that Parliament Square was on the agreed route, just not the end of it. Arriving at Parliament Square did not threfore represent a deviation; the problem is that the march did not leave it again. Here we reach the main issue. Multiple eyewitness accounts testify that the policed route took the march straight to Parliament Square, and allowed it no opportunity to leave again. In short, it was the police who "deviated from the agreed route" by blocking the Whitehall exit and preventing people from taking the pre-agreed route out of the square. In this light, some groups spontaneously taking alternate routes on the way becomes completely irrelevant. In fact it highlights the counterproductivity of police tactics: if mischievous protestors successfully escaped the policed route, the result is the "well-behaved" protestors in a contained area and the "disobedient" ones running free. "I joined the protest on the main march from the University of London Union to Parliament Square in London. I didn't know that was our destination, but it's where police seemed to guide us. After being in the square for while, I went away and came back. When I did, there was a line of police blocking us from entering the square." "Your report (With the clean up comes the blame game. So who did start the violence?, 11 December) does not mention that the police prevented the marchers from following the planned route out of Parliament Square via Whitehall before protesters spilled south into the rest of the square. As a university academic I joined the march to protest against the rise in fees. I arrived in the north-west corner of the square at around 2pm and it was already dangerously overcrowded because the police had left us nowhere to go. Who took the decision to prevent the march from completing its planned route to Victoria Embankment, when was it taken and why? These are just some of the questions that need to be asked of the Metropolitan police in a public inquiry." "We began at Trafalgar Square, when we were told by some Socialist Workers to go to Kings College up the Strand. We met up with the bulk of the protestors there, and we chanted, went in the wrong direction, then walked back down the Strand the way we came. The first bit was definitely police instigated, there were a few riot police down Lancaster Place, I think. We continued down the Strand, and stopped at Trafalgar Square, it was a sort of rally, the police pushed us down the Mall, through the arch with Latin written above it. People started running and I could see Buckingham Palace. We ran down Horse Guards Road and loads of riot police were lining the streets. We went up Great George St into Parliament Square. It was like they wanted us right in front of Parliament for the vote. My brother kept on saying to me, "this is a trap, this is a trap" and he was right, because as soon as the end of the march got into the square, the police cordoned off Great George St."
"The march was very much peaceful until the police began their kettling. This started almost the moment we all gathered in Parliament Square." "I checked route and yes, the end of Whitehall was being blocked by vans; about 50 cops were waiting nearish scot yrd." "The mainstream media cite a police claim that a route for the march was agreed, but that students broke away from it. As can be seen from the photos, after one of the marches set off from Malet Street, by the time it joined the thousands of students already filling Trafalgar Square, they found their route to Parliament Square blocked by lines of police and police horses. Far from allowing the march through, Whitehall was turned into an empty wasteland, and students, sensing a trap, ran into St James' Park and round a back route to Parliament Square. The protesters then arrived at Parliament Square where it had been agreed they could protest, but they came against Boris's ridiculous fences. Also police had cordoned off all of the square at the front of parliament instead of simply putting lines in front of parliament itself. Thus, police had made the area available to protest completely inadequate for the numbers expected. The mainstream lie is that police used containment reluctantly as a final measure, but actually police horses were already deployed and cordons set up at the exits to the square before violence erupted at the front." "The demo started (for most people) with a rally in Malet Street from 12pm, with speakers including John McDonnell (who I chatted to before he addressed the crowd and dashed off to Parliament) and Clare Solomon (de facto NUS leader in many people's eyes). I would guess there were about 10,000 people at this point, with banners from the RMT, PCS, TSSA and a Unison branch. We picked up hundreds more at Kings and LSE on the way, met up with student delegations from South Bank University and Goldsmiths at Trafalgar square and others just made their way straight to Parliament Square. We marched off peacefully around Russell Square, down Southampton Row and Kingsway, through Aldwych (LSE) and onto the Strand (Kings) towards Trafalgar Square. I later learned we were supposed to walk down Whitehall towards Parliament Square. This would have been difficult since there was a two-deep police lines (full riot gear), supplemented further down Whitehall by a barrier of police vans and further police lines. So we rushed through Admiralty Arch, turned left down Horseguards Road and then left via Birdcage Walk/Great George Street into Parliament Square. There were heavy police lines (full riot gear, batons drawn) in front of Parliament reinforced with metal barriers, bags of sand (not the puny sandbags you see people using - usually in vain - to stop their house flooding, but wholesalers tarpaulin bags full of sand, which had crates underneath them showing they had to be lowered by fork-lift truck into position), and police vans. These also covered the exits to Millbank and over Westminster Bridge. Victoria Street also had a police line (again full riot gear, batons drawn). As the rest of the protest flowed in to Parliament Square via Birdcage Walk/Great George Street there was some milling about while protestors got acclimatised to their new surroundings and evaluated the lay of the land. Whitehall was closed off, but far beyond Downing Street (though police lines would later move further down) as were exits through King Charles Street and via the MoD building. After demonstrators were in Parliament Square / Whitehall the police put lines on Birdcage Walk/Great George Street. It was therefore by 2pm a large kettled area - though at that point fairly spacious." At best, these accounts represent a disparate, decentralised protest which did not reach a consensus as to the route. The Met's expectations of unified compliance were misguided; and if they had seriously wanted every protestor to follow a predetermined route, their communication and online engagement prior to the march could have been vastly improved. The "agreed route" was not even announced on the Met's Twitter account ahead of the day - this is the first mention of it. Nor was it publicised by the National Campaign Against Fees and Cuts before last Thursday's protest; their post dated 7 December describes it as a "march on parliament", which certainly implies that parliament would be the end point of the route. If, as seems possible, the change in route was the result of police disorganisation and error, then it is malicious and petty of them to blame it on the protestors, and extremely low to use their own failures as justification for violence. Even if we are to believe the police claim that all the unpleasantness last Thursday began when the march took a different route from the one police were expecting - if that one factor has so much impact on their choice of tactics - then there is a clear need for improved communications. The agreed route should have been widely publicised ahead of time; the process by which it was agreed should have been transparent and public; the protestors should have been informed in advance of the likely consequences of not keeping to this route. If negotiations with police by one subset of an amorphous protest movement carry so much weight, then the processes of liaison should be better organised and more representative. Climate Camp, another decentralised and leaderless activist group, has successfully developed a police liaison team which performs this role and reports back to the group. But the unaffiliated nature of many participants in the anti-cuts protests complicates this process; when so many of the numbers are made up by school students, sixth formers and people who are not marching under any official banner, can smaller, more organised activist movements speak on behalf of all? More broadly, this raises important questions about the legitimacy of protest. In practice, it is the police and the mainstream media who decide at what point protestors cross the line from "peaceful" to "violent" (which is used to include property damage and disruption, and very rarely actually refers to physical harm done to a person by an activist), thereby justifying a heavy-handed police response. Even if groups within the march did spontaneously deviate from an agreed route, it does not strip the protest of all legitimacy; and it certainly does not justify generalised containment, baton charges and everything else that followed. The most worrying aspect of these eyewitness accounts is the possibility they represent when compared with official police statements: that the Met, deliberately or accidentally, prevented the protest from taking the route that had been agreed, and then used this "deviation" to excuse their subsequent brutality. Re: Did Dayx3 protest "deviate from the agreed route"? Serious attention should be paid to the issue of when a protest becomes a riot. It seems that the police came prepared for a riot and dressed accordingly. Perhaps giving the protesters something to fight against ensured that any peaceful activists were overrun by those wishing to vent their anger on the nearest form of officialdom e.g. the police, the treasury and the court. I hope that you continue with this great blog. I really enjoy visiting your webpage to check out your latest posts. Just thought you might like to hear that.